Indiana Jones and the Kingdom of the Crystal Skull is a 2008 American action-adventure film. It is the fourth installment in the Indiana Jones series created by George Lucas and directed by Steven Spielberg. Released nineteen years after the previous film, the film acknowledges the age of its star Harrison Ford by being set in 1957. It pays tribute to the science fiction B-movies of the era, pitting Indiana Jones against Soviet agents—led by Irina Spalko (Cate Blanchett)—searching for a telepathic crystal skull. 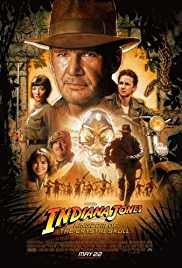 Indiana is aided by his former lover, Marion Ravenwood (Karen Allen), and their son, Mutt Williams (Shia LaBeouf). Ray Winstone, John Hurt and Jim Broadbent are also part of the supporting cast.